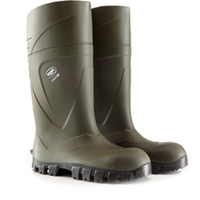 The Dunlop Warwick is a quality PVC wellington, it is a must-have for everyone who wants to work in comfort in the heavy industry sectors. This boot was designed with comfort, durability and safety in mind. HOW DOES THIS BOOT PROTECT ME? Foot injuries at workplaces are very common and it may come in any shape and size. This is why wearing safety shoes or boots with toe caps is essential as it will protect your feet from mishaps. The Dunlop Warwick has a steel 200J toecap and a compression at a load of 15 kN. This boot has a steel midsole penetration is prevented until a force of 1100 N.
These are SRA classified boots are tested and certified for slip resistance on ceramic tile floors covered with a dilute soap solution. The tests are based on measuring the coefficients of friction in forward heel slip and forward flat slip state. The results provide a good indication of the actual slip resistance of the boots in practice on slippery tile surfaces. 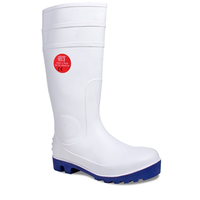 The Dunlop Warwick is made from quality PVC which ensures that your feet stay dry and safe throughout the workday. 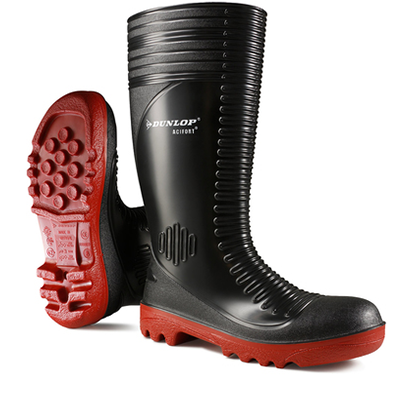 The Dunlop Warwick offers protection against a wide variety of chemicals. The specific application with types of chemicals encountered and conditions faced will determine which boot should be opted for. The Dunlop Warwick are made with wide fitting legs for comfort. These boots are designed offer a perfect fit, optimizing comfort for everyday use.